RSVP to joanne@artsadmin.co.uk In 2005 performance artist, dancer and choreographer Greta Mendez was awarded an Artsadmin bursary and an Arts Council England grant. Greta travelled to Shanghai, Chongquin, Lashihai and Delhi, India, where she met and in some instances collaborated with many artists from those regions. 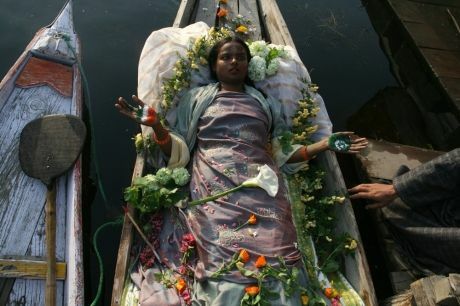 In 2010 Greta participated in Art Karavan International, an initiative developed by Indian artist Inder Salim. She joined Karavan in Shimla and journeyed on to Jammu, Srinager and Delhi. The central premise of the Karavan was to involve local Indian and international artists, to find a vehicle for common expression, common ground. For this event Greta will share some of the work created, tell a few anecdotes and introduce the work of artists from Bangalore, Patna, Assam, Serbia as well as Lashihai, Shanghai and Chongqing.